You’re not the only one out there – insomnia is something that affects 40% of Canadians today and according to a survey done by the American Sleep Association, up to 70 million adults in the US experience sleep disorder symptoms in some form. So as it turns out, insomnia isn’t so uncommon, after all. And with so many folks affected around the world, experiencing problems while sleeping, there’s been a keen interest in a cure that may at first glance sound controversial – medical cannabis. In the medical cannabis community, many will stand by its positive effects on sleep, saying that it can cure a range of slumber disorders with practically no side effects. In fact, one medical cannabis physician claimed that marijuana as a sleep aid is something which should not be overlooked – it can work wonders to restore the natural sleep/wake cycle – a vital component of quality sleep often thrown out of whack due to too much stress and busy schedules. No matter what your reason for using cannabis – if you are battling with a sleeping disorder, it pays to know what potential and promise cannabis holds. It really pays. THC (Tetrahydrocannabinol) is considered a psychoactive compound – meaning it gives users that high and euphoric feeling. CBD (Cannabidiol), which also has many health benefits, is a non-psychoactive compound – there’s no ‘high’ feeling as such. Even though the former is responsible for inducing the energising high you feel after consuming cannabis, it is also, interestingly, responsible for causing feelings of relaxation which can often induce sleep. However, for the sake of using cannabis as a sleep aid, you’d always want to aim for a strain which has both CBD and THC, but the latter in a significantly higher ratio. A study done a decade ago concluded that consuming high-THC cannabis strains will reduce the amount of REM (rapid eye movement) while sleeping. Now, this is an important element to consider if you wish to consume marijuana for better sleep. It is during the REM phase that we go into a deep sleep phase which promotes healing and recovery from the daily stress we accumulate. So, in theory, reduced REM means less restorative sleep which may, in the long run, inhibit optimal immune and cognitive function. Higher-THC cannabis, therefore, may impair your ability to go into deep sleep, but only if taken on a long-term basis and in relatively high, everyday doses. On the up side, reduced REM means you’re far less likely to experience not only dreams but also nightmares – a benefit to those who experience frequent episodes of PTSD (post-traumatic stress disorder). Going back to cannabis affecting REM cycles, this is not something that applies across the board to every cannabis user – although studies have demonstrated that cannabis will alter regular sleep cycles one way or another. So, we need to determine how to best use cannabis in order to promote restful sleep, not the other way around. Multiple studies have shown that CBD and THC are two key cannabinoids that can help remedy sleep disorders. However, the effects both these compounds have can be markedly different – depending on whether you’re using a THC or CBD-dominant medicinal cannabis product. Undeniably, the most important element to consider when it comes to the whole THC versus CBD for better sleep affair, is to come to terms with how these two cannabinoids affect sleep. Even though both can aid you in getting quality sleep, the way they accomplish this is quite different. THC, for example, boasts potent sedative properties – how it communicates with your brain’s cell receptors can profoundly affect your sleep/wake cycle – high-THC capsules and oils will usually make you feel drowsy and ready to get in bed. These findings have been backed by research published in the Journal of Clinical Psychopharmacology. In the research, investigators tested cannabis’ effects on sleep with regard to specific extracts. It was revealed that 15mg of THC can increase sleepiness while resulting in overall reduction of sleep latency. However, it was also discovered that certain cognitive abilities such as memory were impaired, even though the subjects reported feeling sleepier with certain changes in their mood. Research to date done on CBD has revealed that it can decrease stage 3 sleep – i.e. deepest sleep cycle – but counteracts any sleepiness or drowsiness felt the next, which is the case with THC. Even THC has certainly found its place when it comes to producing a noticeable sedative effect, this certainly doesn’t mean that CBD does not have its own unique place in terms of sleep disorder treatment. Owing to its pain relieving properties and soothing after effects, CBD works very well to treat symptoms that may be associated with certain health conditions, which are in turn, causing sleep disorders. Therefore, CBD is an incredibly powerful cannabinoid when it comes to reducing anxiety, alleviating pain and inflammation, just to name a few, which means it can help you regulate everyday sleep patterns. How it exactly accomplishes this is also noteworthy – the non-psychoactive compound modulates wakefulness through activation of specific neurons in the hypothalamus and DRD (Dopamine Receptor D) within grey matter. So in plain terms, CBD will make you more aware of your surroundings. Somewhat counterproductive, don’t you think? But people are still using it as a sleep aid, despite its ability to prevent drowsiness. Furthermore, CBD is a great aid for anyone who generally wants to sleep less or wants to shift to a healthier, more consistent sleep/wake cycle. After all, sleeping disorders do not only have to do with the inability to fall asleep, but also sleeping too much at times, or not being able to sleep/wake up at the same time every day. As we mentioned earlier, a medicinal cannabis strain which has both CBD and THC, with the latter in a higher ratio, would make for a perfectly balanced cannabis sleep aid. 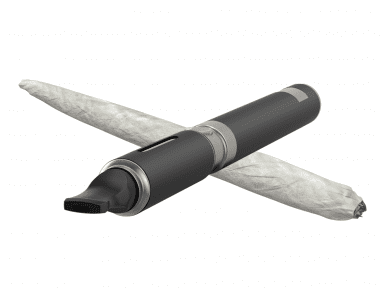 Majority of cannabis users ingest it through a pipe, bong or vape, although a joint seems to be the go-to choice for many. However, if you want to give your lungs a break or generally don’t want that signature cannabis odour to hover around in your home, go for THC-rich tinctures or vaping devices instead. Next, you’d want to consider the right amount of herb to consume. This may take a little bit of trial and error, so you would be wise not to try this in the middle of the work week. However, if your anxiety and curiosity gets the best of you, you might try vaping or smoking it, and begin with just a few puffs to assess the effects. You definitely don’t want to overdo it unless you want to feel groggy and hung-over the next morning. A good rule of thumb to remember is that if you’ve initially started with a very mild dose an find yourself waking up in the middle of the night for a quick re-dose, that’s much better than waking up with a heavy head. However, the only exception to this rule is that you should avoid a re-dose if you’re waking up within the next 4 hours. Take a mental note (or write it down if you like) of how you feel after your pre-bedtime dose and how you felt in the morning. Your ‘high’ may vary from feeling a bit euphoric to a phase where time seems to slow down, to more enhanced reactions such as the ‘dry cotton mouth’ effect. Naturally, all sleep aids are not created equal – the same can be said for medicinal cannabis. For instance, prolonged cannabis use can lead to an increased risk of myocardial infarction, so those suffering from poor heart health or a family history of heart attacks may need to avoid it. In addition, cannabis has many strains that can cut down anxiety, but certain THC-rich strains can actually increase anxiety and paranoia. If you’re the kind who is particularly susceptible to easily getting anxious or paranoid, then you may need to ‘err’ on the side of caution and let your online dispensary know that you’re looking for strains to help lower anxiety and aid in better sleep. There are obviously a variety of factors that come into play when it comes to getting a good night’s rest – but for someone who’s been suffering from long-term sleeping disorders, cannabis holds a lot of promise.